Fast rising Hip hop & R’n’B duo ZEELEX, unveils the video to their latest single “GO”. After the success of their earlier single *ONE OF A KIND*, the dynamic brother duo (ZEELEX) return with a frenzy, dishing this up-tempo dance track, calling all party riders to get up and “GO”. The video is directed by Clarence Peters. 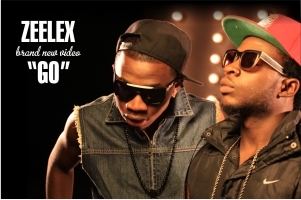 Born in Kaduna State northern Nigeria, the brother duo of Justin (Zeezee) Peter and Tony (Tilex) Peter make up the dynamic ZEELEX. Justin and Tony are the only sons of their parents and are right between two wonderful sisters. Their family exposed the boys to life, music, dance and the value of hard work. As youngsters, they started out their singing and love for music, in the local church choir. In 2009, they began working together as a new age contemporary Nigerian music group, and by 2011, they released two singles 'Baby Don't Go' and 'Sumomi Dada' which quickly garnered fame in both clubs and radio in their home town of Kaduna and Nigeria’s capital city, Abuja. Although both brothers love to rap and sing, Zeezee who is eldest of the two is more at home rapping, he’s earlier influence include, Jay –Z, kanye West, M.I, Sauce Kid & Ice Prince, while Tilex is a powerful singer, whose influenced by Chris Brown, 2Face Idibia and lots more. Currently signed on to Don G Entertainment, Zeelex moved to Lagos in a bid to strike at the heart of entertainment in Africa, released two singles ‘One of A Kind’ and the just released “Go” a party friendly approach to warm their way into the hearts of many. Eager to showcase their talent and variety in music to the world, they have refused to rest and continue to work hard with the best hands in the business on making good music.